The practice of daily moments of gratitude and thanksgiving has been part of my life for years and years. I try to remember to do a Thankful Thursday every week with my social media groups. I have noticed that while gratitude doesn't change circumstances, it does fuel us to decide how to respond to those circumstances. So while many of us book bloggers are talking books to be thankful for, I had to change it up a bit, and let you all know how thankful I am for you! 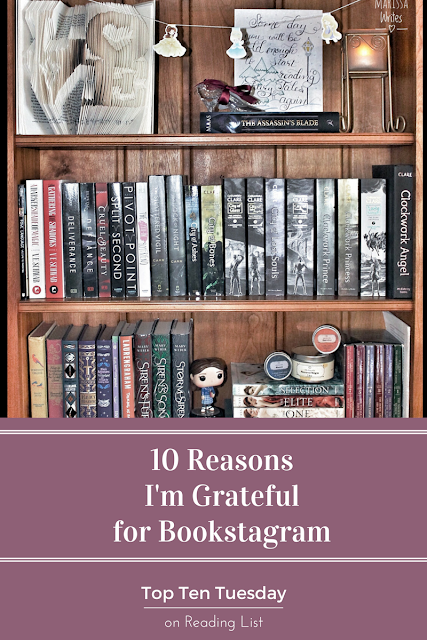 I have been in the Bookstagram community for about a year and a half. During that time I have met some of the nicest people who love to spend their time with a book, and because of that, we might have never met otherwise. It's a shame that those of us who are introverted often are ignored simply because we do not try to step out and meet new people. But all the same we are there. 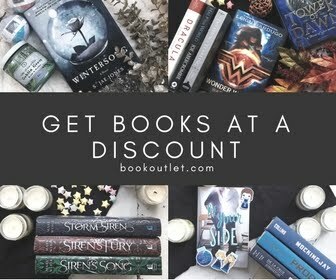 Best way to find new books - there are so many lists across the internet, add on all the paid for reviews on store sites, and I never know where to start with new books. But with the lovely bibliophiles of bookstagram I can get all kinds of honest, quick, and fair reviews of books to read next. Bibliophiles to buddy read with - I love the idea of a book club, but there are not many options nearby for me, not to mention I'm a bit too shy for such an endeavor. 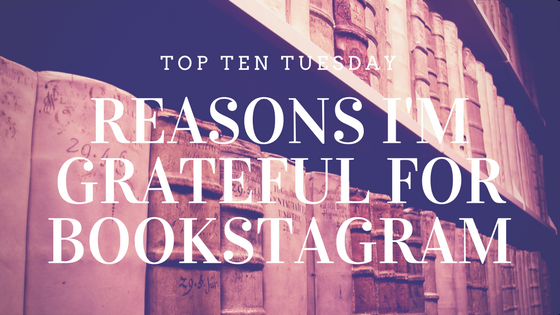 However, bookstagram is full of lovelies who will read with you, or gush over a book they just finished. Find out news directly from authors - There are many great authors who share their writing tips and news directly on Instagram, and it is too fun to miss hearing from favorite authors and discovering new ones. Validation over my desire for more bookshelves - and all those extras need to be displayed somewhere... bookstagram is like a live, always updated Home & Garden magazine specially for book lovers! The chance to fine tune my photography skills - as a lifestyle photographer, I tend to capture moments in action... running along side a toddler or trying to get a moment where all five members of a family look like they are enjoying life to the fullest... and while that's fabulous, there is something different about capturing stationary objects, and often takes just as much patience. Continual practice at editing - along those lines, it never fails that new changes to editing software comes along all the time, and a chance to try it out on a platform that is all about feedback and change is fabulous! Add in the fun of doing live videos, and quick stories... well it's just too fun. An excuse to buy new holiday decor for every single little holiday - we all know those little extra baubles that Target and TJMaxx always display call our names, but what do we do with them?? Well of course take photos with books!!! 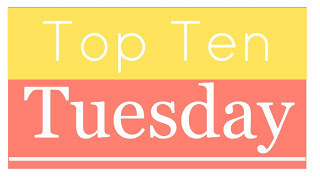 Too many amazing people - so this a little bit of a cheat, because the people make everything else possible on this list... but to be honest, I am eternally grateful to all the lovely girls, and guys that I have found through bookstagram - friends that I honestly consider family now, girls that are always there to gush over the newest book boyfriends, readers who are also writers, readers who run, readers who craft, readers who love music... seriously I could go on for too long... but over all I'm just so glad to find new people who are unique in every way, all while sharing a love for the printed word. 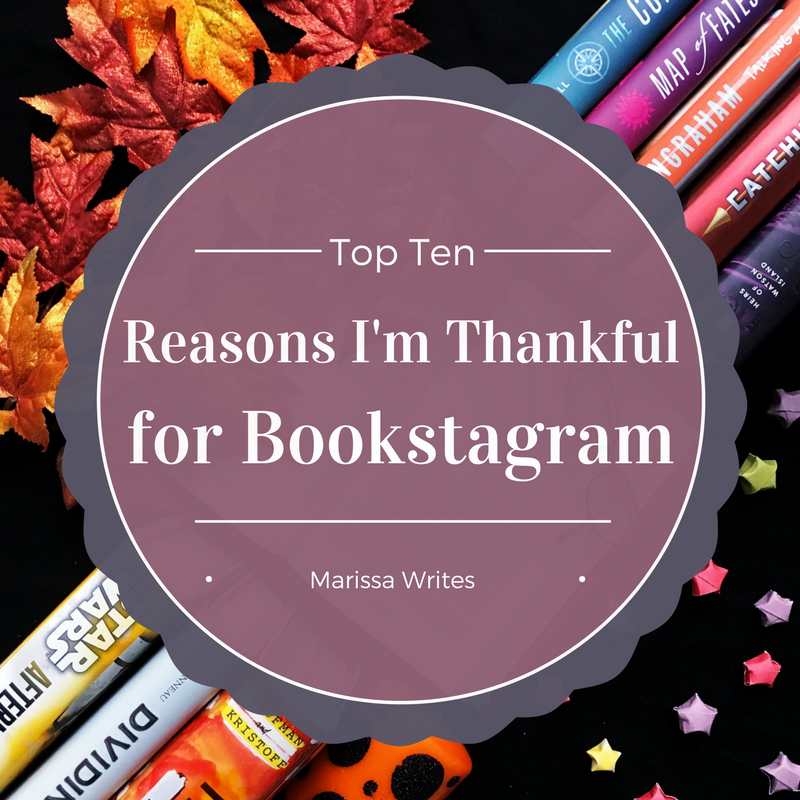 So, are you on bookstagram yet??? If you are, follow me! 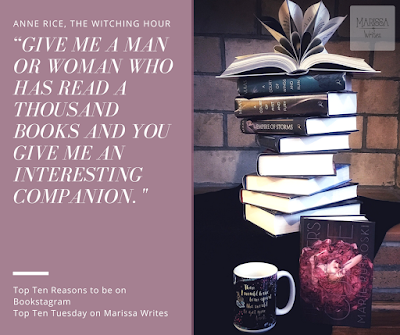 I'd love to see your love for books, and chat over all things books... I am a serious book gusher. 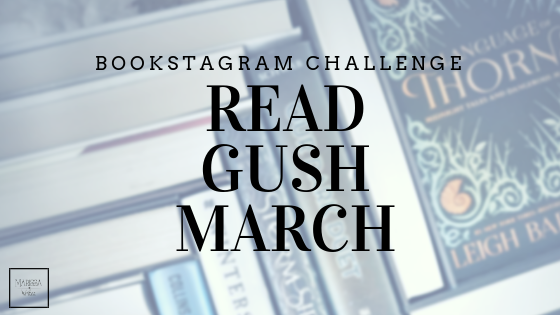 I host a monthly challenge called read & Gush!!! If you aren't, let me help you get started... just follow this link. Aww what a cute way of interpreting this week's topic! I tend to warp the week's topics a lot... but this one was too fun not to!